From the middle of the 1960s, combination chemotherapy was at the center of chemotherapy for cancer. Following successful treatment of various hematologic malignancies through combination chemotherapy, significant effort was aimed at utilizing such treatments in patients with solid cancers. 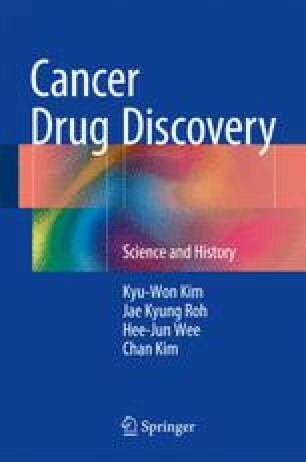 Research into solid cancer treatment using combination chemotherapy was a core component of anticancer research programs from 1970s, but in spite of long-term, large-scale clinical trials, revolutionary results did not emerge, and the progression of anticancer chemotherapy has gradually slowed since 1980. Ultimately, in 2003, it was determined that mega-dose combination chemotherapy combined with bone marrow transplant was not superior than conventional combination chemotherapy in advanced breast cancer, and it was widely believed that cytotoxic chemotherapy had reached its limit as a treatment for solid cancer. The failure of mega-dose cytotoxic chemotherapy as a treatment for solid cancers showed researchers that a deep biological understanding of the complexity and diversity of individual types of cancer was essential for more effective cancer treatment.